A Liberal's Libretto: What makes opera grand? Let's ask Leonard Bernstein. Leonard Bernstein made a few instructional appearances in the 1950s on Omnibus, a television program about science and the arts. Some of the appearances have just been released on DVD. 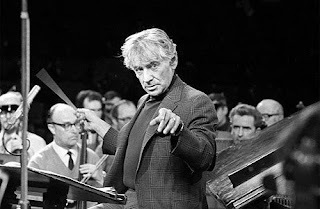 Want to see Bernstein's ideas on what makes opera grand? Check out the New York Times video here. Good video clip. I like that he picks up on how a single note change can chanage the meaning and emotion in a piece of music. Extremely clever and effective!